Ching Dynasty. 7/8" diameter. Originally used as an insignia of rank in a Mandarin Court Necklace. 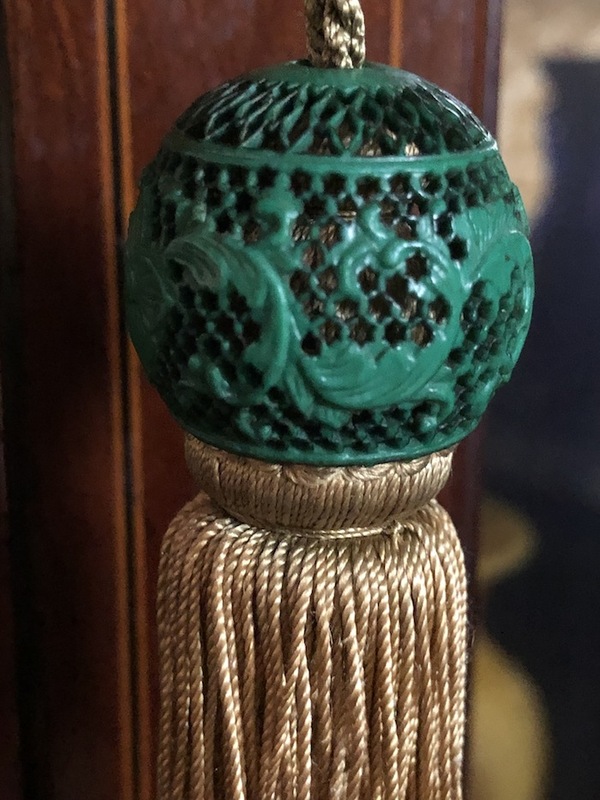 Now I am using it on a tassel suspended from a cabinet key. While I feel certain it is most likely from a Mandarin Court Necklace, it is unusual in decoration and material. The curlicue leaves are reminiscent of stylized versions of The Dragon in the Sea. Almost always, this malachite green color is usually found on dyed walrus ivory. And usually, latticework beads are bone. In the photograph, the bead appears to be lacquered. But if you were to see it in peson, I feel you may come to agree that it is some type of dyed ivory with a shiny patina.